I baked peach pies yesterday, something every good Mennonite girl learns how to do growing up in Indiana. I made little ones that are eaten individually so you feel less guilty. And don’t forget the vanilla Haagen Dazs, the final touch to an unforgettable mouthful. I posted on Instagram and many asked for the recipe so here goes for you or someone who can bake you up one of these beauties. It IS peach season afterall, so rally yourself some peachy yumminess and savor the summer-time joy. Combine all ingredients. Put into crust-lined mini tart pans or a 9″ pie plate. Dot with butter and top with a top crust or lattice crust strips. If using a top crust be sure you cut vents in the crust. Brush top crust lightly with cream and sprinkle lightly with sugar. 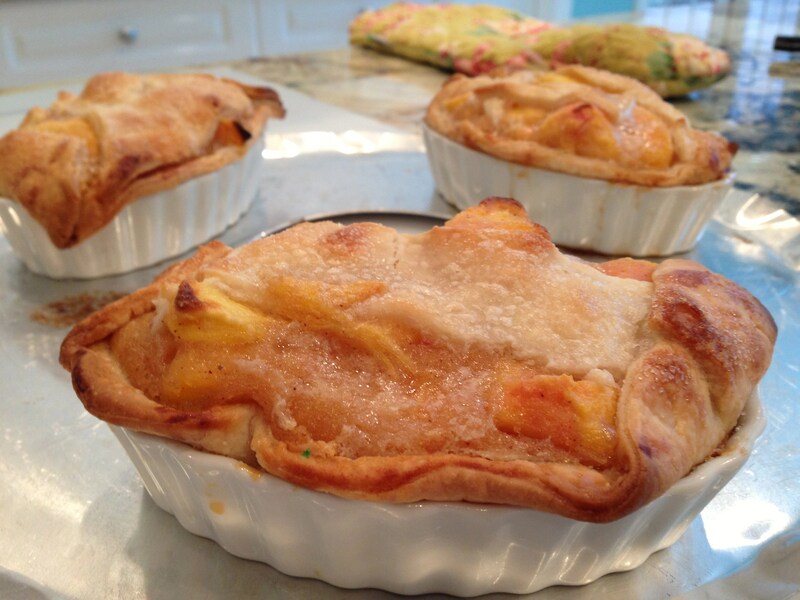 Bake at 400 for 40-45 minutes or til crust is golden brown and peaches are soft, less time if using small pie tart pans. Serve with vanilla ice cream on top. Enjoy every bite! Red Velvet Redo, Celebrating Cady Lew Happy National Chocolate Chip Day! Dreamers Are Innovators Ok, the obvious question is — how do you eat pie and ice cream and stay so SKINNY!?!?! !